SYDNEY - Tobacco giant Philip Morris launched legal action on Monday against the Australian government over the country's plans to strip company logos from cigarette packages and replace them with grisly images of cancerous mouths, sickly children and bulging, blinded eyes. The government believes the new rules will make the packages less attractive to smokers and turn Australia into the world's toughest country on tobacco advertising. Several outraged cigarette makers have threatened lawsuits, arguing the move illegally diminishes the value of their trademarks. Philip Morris is the first of those companies to file a claim for compensation. "We would anticipate that the compensation would amount to billions," Philip Morris spokeswoman Anne Edwards told The Associated Press. The legislation, which will be introduced to Parliament in July, would ban cigarette makers from printing their logos, promotional text or colorful images on cigarette packs. Brand names will instead be printed in a small, uniform font and feature large health warnings and gruesome, full-color images of the consequences of smoking. The law would be phased in over six months, starting in January 2012. In the most significant change to U.S. cigarette packs in 25 years, the Food and Drug Administration released nine new warning labels last week that depict in graphic detail the negative health effects of tobacco use. Can gruesome warning labels save lives? Hong Kong-based Philip Morris Asia Limited, which owns the Australian affiliate Philip Morris Limited, filed a notice of claim on Monday arguing the legislation violates a bilateral investment treaty between Australia and Hong Kong. The tobacco company says the treaty protects companies' property, including intellectual property such as trademarks. The plain packaging proposal severely diminishes the value of the company's trademark, Edwards said. "Our brands are really one of the absolute key valuable assets that we have as a company  it's what helps us compete, it's what enables us to distinguish our products," Edwards said. "This move ... would essentially amount to confiscation of our brand in Australia." The government denied the plan breaks any laws and said it would not back down. 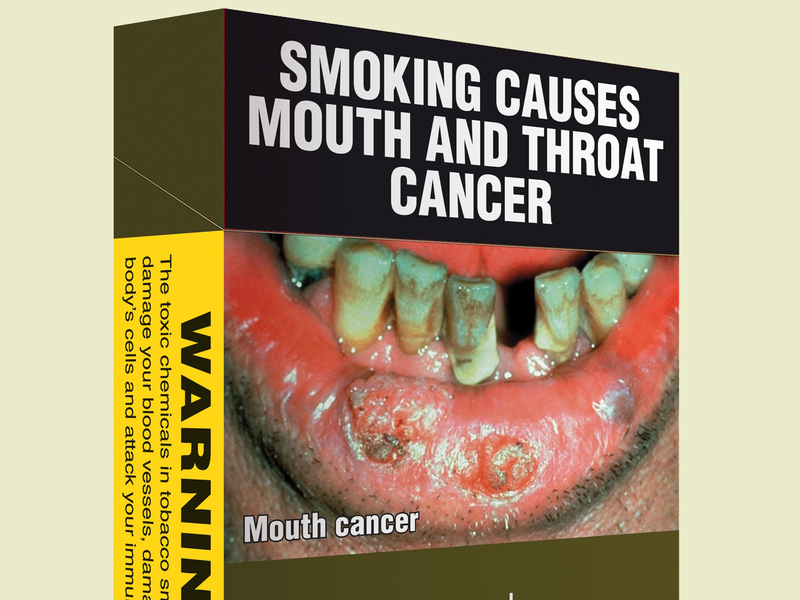 "Our government is determined to take every step we can to reduce the harm by tobacco," Health Minister Nicola Roxon said. "We won't be deterred by tobacco companies making threats or taking legal action." Prime Minister Julia Gillard also brushed off Philip Morris' threats. "We're not going to be intimidated by big tobacco's tactics," she told Australian Broadcasting Corp. The legal notice filed Monday opens up a three-month period of negotiation between the two sides. Philip Morris said if a "satisfactory outcome" isn't achieved by the end of the three months, it will seek arbitration.